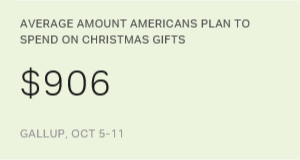 WASHINGTON, D.C. -- Gallup's November update of Americans' 2017 holiday spending plans finds consumers planning to spend an average $862 on Christmas gifts this year. That is sharply higher than their planned spending at this time last year. It is also significantly higher than their estimate in any November since 2007 -- just before the 2007-2009 recession. Americans current holiday shopping estimate of $862, based on a Nov. 2-8 poll, is down slightly from $906 in October. Such a decline is typical in Gallup's November readings, perhaps because consumers are running out of time to do all the shopping they originally intended. However, it is still up sharply from the $752 recorded at this time last year. The $110 increase in Americans' spending intentions compared with 2016 cannot be directly converted into a precise retail spending forecast. 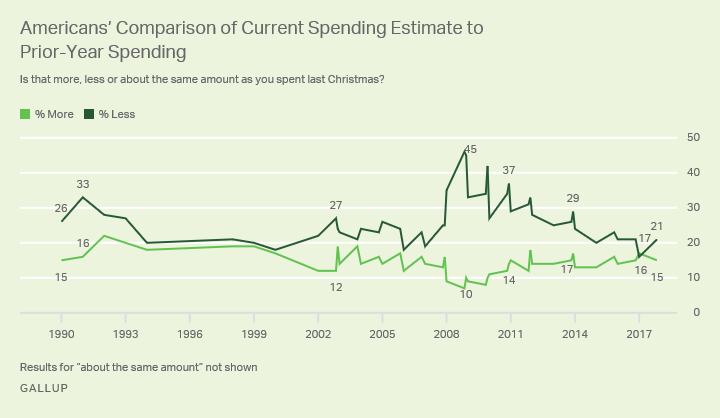 However, Gallup modeling shows that big year-over-year increases, such as this year's, are usually associated with strong holiday shopping seasons. That means holiday spending growth in 2017 could exceed the estimated 3.6% growth that, according to the National Retail Federation, occurred in 2016. Thirty-four percent of U.S. adults expect to spend $1,000 or more on Christmas gifts this year, slightly more than the 30% in the top spending category a year ago. Another 22% say they will spend between $500 and $999; 15% will spend between $250 and $499; and 18% will spend less than $250. Nine percent of U.S. adults say they don't celebrate Christmas or won't be spending anything, while 2% are unsure how much they will spend. Although the average amount all Americans expect to spend on gifts is $862, the figure rises to $947 when those who won't be spending anything are excluded -- in other words, just among Christmas shoppers. Americans living in households earning $75,000 or more per year plan to spend an average of $1,327 on Christmas gifts this season. This drops to $739 among those earning between $30,000 and $74,999, and to $343 among those earning less than $30,000. The figures are up compared with 2016 among high- and middle-income earners, while unchanged among the lowest income group. Despite Americans' robust Christmas spending plans, their enthusiasm has abated a bit in the past month. Along with the decline in their average-dollar-amount spending predictions, the percentage saying they will spend less than in 2016 has gone up, and now exceeds the percentage saying they will spend more -- 21% vs. 15%, respectively. The current results are more typical of what Gallup has found historically. The October reading was the first time since 2003 that the percentage planning to spend more was roughly equal to the percentage spending less. Americans intend to spend more this holiday season than they have in a decade. Whether consumers wind up splurging or just being a bit more generous in their outlays than usual could be influenced by how the stock market and other U.S. economic indicators perform in the coming weeks, as well as any action on Capitol Hill perceived as affecting the middle class. For now, however, consumers are in a spending mood, meaning that getting them into stores early could be critical to retailers' efforts to score big this holiday season. Results for this Gallup poll are based on telephone interviews conducted Nov. 2-8, 2017, with a random sample of 1,028 adults, aged 18 and older, living in all 50 U.S. states and the District of Columbia. For results based on the total sample of national adults, the margin of sampling error is ±4 percentage points at the 95% confidence level. For spending, the margin of error for results based on the total sample of national adults is ±$63 at the 95% confidence level. All reported margins of sampling error include computed design effects for weighting. 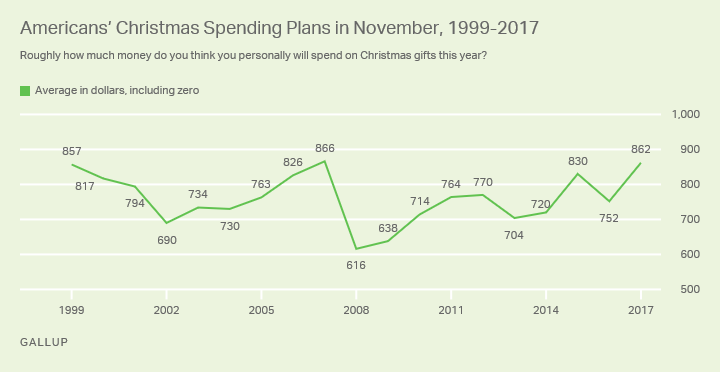 Americans have big plans for holiday gift buying this year; their average spending projection of $906 is the highest since 2007. A solid majority of "financially stressed" Americans continue to find more enjoyment from saving than from spending, a significant change from the years prior to the Great Recession. Americans continue to characterize themselves as the type of people who enjoy saving money more than spending it, and say they are spending less in recent months rather than spending more.